These words were not spoken as a rebuke, nor even with surprise; Jesus was encouraging Philip to draw closer. Yet the last person we get intimate with is Jesus. Before Pentecost the disciples knew Jesus as the One who gave them power to conquer demons and to bring about a revival (see Luke 10:18-20). It was a wonderful intimacy, but there was a much closer intimacy to come: “…I have called you friends…” (John 15:15). True friendship is rare on earth. It means identifying with someone in thought, heart, and spirit. The whole experience of life is designed to enable us to enter into this closest relationship with Jesus Christ. We receive His blessings and know His Word, but do we really know Him? Jesus said, “It is to your advantage that I go away…” (John 16:7). He left that relationship to lead them even closer. It is a joy to Jesus when a disciple takes time to walk more intimately with Him. The bearing of fruit is always shown in Scripture to be the visible result of an intimate relationship with Jesus Christ (see John 15:1-4). Once we get intimate with Jesus we are never lonely and we never lack for understanding or compassion. We can continually pour out our hearts to Him without being perceived as overly emotional or pitiful. The Christian who is truly intimate with Jesus will never draw attention to himself but will only show the evidence of a life where Jesus is completely in control. This is the outcome of allowing Jesus to satisfy every area of life to its depth. The picture resulting from such a life is that of the strong, calm balance that our Lord gives to those who are intimate with Him. This week, we study one of the forefathers of our faith. Abraham, an obedient servant, who – through faith – trusted God, His provisions, and His guidance, has established a blueprint for how to live a life pleasing to Him. 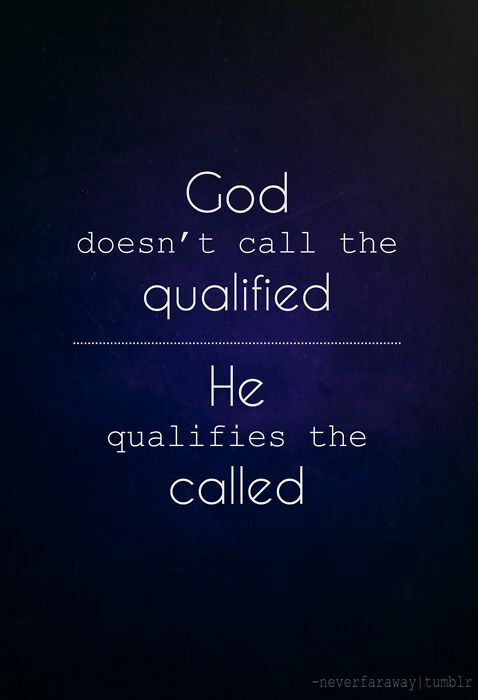 As Abraham was called, so too are we all called. Trust that this call is personal, missional, and will take us out of our comfort zone. It is an invitation for us to live for something bigger than ourselves. Listen in as Pastor Jason Fritz delves deeper into this story. William Carey was a sickly boy, born to a humble family near Northampton, England. His future didn’t look too bright. But God had plans for him. Against all odds, he moved to India, where he brought incredible social reforms and translated the Bible into several Indian languages. He loved God and people, and accomplished many things for God. David, son of Jesse, was an ordinary young man, the youngest in his family. He was seemingly an insignificant shepherd on the hills of Bethlehem (1 Samuel 16:11–12). Yet God saw David’s heart and had a plan for him. King Saul had been rejected by God for disobedience. While the prophet Samuel mourned Saul’s choices, God called Samuel to anoint a different king, one of Jesse’s sons. When Samuel saw the handsome, tall Eliab, he naturally thought, “surely the Lord’s anointed stands here before the Lord” (v. 6). However, God’s strategy to select a king was much different than Samuel’s. In fact, God said no to each of Jesse’s sons, except the youngest one. Selecting David as king was definitely not a strategic move from God’s part, or so it seemed at first glance. What would a young shepherd have to offer his community, let alone his country? How comforting to know that the Lord knows our hearts and has His plans for us. Dear Lord, thank You that You care more about my heart’s attitude toward You than my outward beauty, possessions, or achievements. Welcome to Estera Pirosca Escobar! Meet all our authors at odb.org/all-authors. God’s priority is your heart. Samuel, whose name means “heard by God,” was Israel’s last judge as well as a priest and prophet. Samuel was born during the time of the judges at a turning point in Israel’s history. The son of Hannah and Elkanah, Samuel was dedicated to the Lord by his mother. As a little boy, Samuel went to live in the “house of the Lord at Shiloh,” the tabernacle (see 1 Samuel 1:24–28). There he was trained under the guidance of the priest Eli, and there he received a special calling from God (3:1–21). Samuel anointed the first king, Saul (chs. 9–10); and in today’s passage we see him preparing to anoint David, Saul’s replacement (16:1–13). And I thank Christ Jesus our Lord, who hath enabled me for that he counted me faithful, putting me into the ministry. “Your calling,” said Meister Eckhart to the clergy of his day, “cannot make you holy; but you can make it holy.” No matter how humble that calling may be, a holy man can make it a holy calling. A call to the ministry is not a call to be holy, as if the fact of his being a minister would sanctify a man; rather, the ministry is a calling for a holy man who has been made holy some other way than by the work he does. The true order is: God makes a man holy by blood and fire and sharp discipline. Then he calls the man to some special work, and the man being holy makes that work holy in turn…. Keep me focused today on being the person You want me to be, no matter how significant or insignificant the work You ask me to do. Amen. Let every one of us please his neighbor for his good.—Romans 15:2. Let us consider one another.—Hebrews 10:24. Look around you, first in your own family, then among your friends and neighbors, and see whether there be not some one whose little burden you can lighten, whose little cares you may lessen, whose little pleasures you can promote, whose little wants and wishes you can gratify. Giving up cheerfully our own occupations to attend to others is one of the little kindnesses and self-denials. Doing little things that nobody likes to do, but which must be done by some one, is another. It may seem to many, that if they avoid little un-kindnesses, they must necessarily be doing all that is right to their family and friends; but it is not enough to abstain from sharp words, sneering tones, petty contradiction, or daily little selfish cares; we must be active and earnest in kindness, not merely passive and inoffensive. The labor of the baking was the hardest part of the sacrifice of her hospitality. To many it is easy to give what they have, but the offering of weariness and pain is never easy. They are indeed a true salt-to-salt sacrifices withal. This is spoken to a childlike believer, who was ready to accept Jesus as the Son of God, the King of Israel, upon one convincing piece of argument Those who are willing to see shall see: it is because we shut our eyes that we become so sadly blind. We have seen much already. Great things and unsearchable has the Lord showed unto us, for which we praise His name; but there are greater truths in His Word, greater depths of experience, greater heights of fellowship, greater works of usefulness, greater discoveries of power, and love, and wisdom. These we are yet to see if we are willing to believe our Lord. The faculty of inventing false doctrine is ruinous, but power to see the truth is a blessing. Heaven shall be opened to us, the way thither shall be made clear to us in the Son of man, and the angelic commerce which goes on between the upper and the lower kingdoms shall be made more manifest to us. Let us keep our eyes open toward spiritual objects, and expect to see more and more. Let us believe that our lives will not drivel down into nothing, but that we shall be always on the growing hand, seeing greater and still greater things, till we behold the Great God himself, and never again lose the sight of Him.